Quality bicycling trails help define a region’s quality of life. They provide health and transportation benefits. They’re fun and becoming a major tourism draw for the places with compelling facilities. Trails appeal to teenagers, millennials, families, and retirees. Unfortunately, the Baltimore region’s combination of trails is far inferior to Washington’s, Philadelphia’s, New York’s, Boston’s, and we are falling behind Pittsburgh. These other northeastern metros have invested far more and have developed networks and high profile trails. Our region should at least try to be in the same league. The good news is–the six projects identified below, collectively, would cost less than one basic highway interchange and help Baltimore take a giant leap forward. Other Northeastern Metros are investing in their trail systems. Here are a few of their investments. Right now, Baltimore has a handful of average to good trails, but mostly they are one-offs, with little relation to one another. Imagine if I-95 didn’t connect to the 695 Beltway and 695 didn’t connect to I-83 or 795. These highways by themselves would be useful, but the connected network is exponentially more beneficial. Over the next decade, the Baltimore region should connect its primary trails. It should also develop a few marquis trails that show off the beauty of our city, watershed, and region. Here are six projects that would create the backbone of a connected regional trail network reflective of our affluent region. Project 1, from the Middle Branch Trail’s end in Baltimore’s Cherry Hill Park, to the BWI trailhead-at the BWI rail station, is approximately 10 miles. By completing this missing link, the trail network could continuously reach from Mt. Washington in Northern Baltimore City to Greater Annapolis, a roughly forty mile spine. There is good news. It’s feasible. The Patapsco River and Stony Run tributary valleys provide virtually continuous right-of-way, which would make the trail relatively free of street crossings, with little need for property acquisition or easements. There are more reasons to like this project. The river valleys provide great scenery of Baltimore’s most significant river. There are marshes, riverscapes, forests and lots of other features that make for a scenic recreational trail. If project 1 is completed, the trail will connect job centers, neighborhoods, and the rail transit system. This project is the urban trail version of I-695. 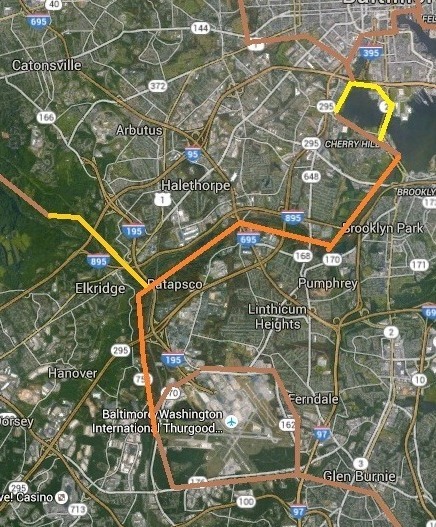 It fills in the gaps that would enable a continuous 35 mile loop in Baltimore City. To complete the loop a little over 10 miles of trails would need to be constructed and some additional upkeep on existing trails would improve the experience. This project is being spearheaded by the Rails to Trails organization, headquartered in Washington DC. This project may not be as logistically easy as Project 1 because it loops through neighborhoods and requires cooperation with CSX and BGE in a few places. However, a theoretical right-of-way has been established and with a little cooperation, this project is feasible. There are lots of reasons to like this project. It has many of the benefits of Atlanta’s Beltline, but with a fraction of its price. 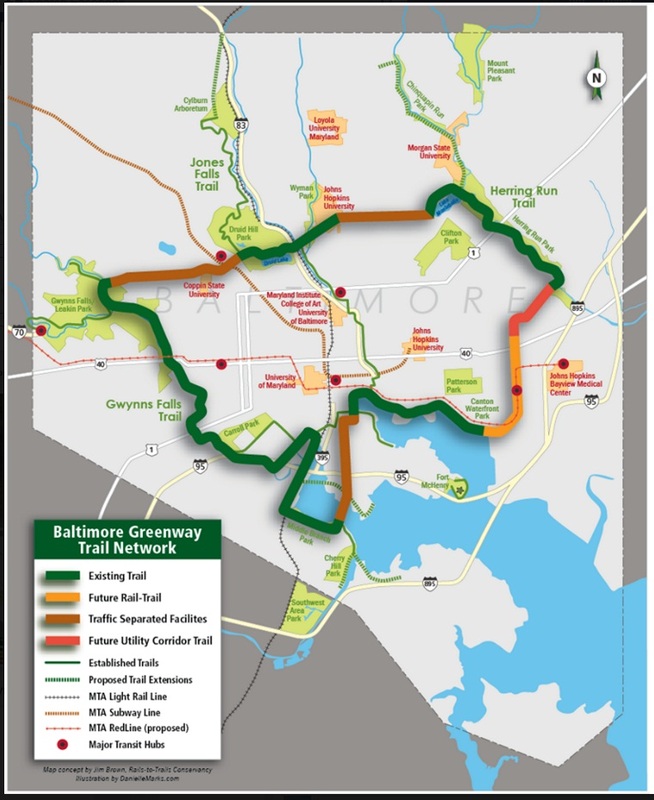 The Baltimore Trail “Beltway” is a home run waiting to be hit because it covers so many bases. Tourism, health, better transportation, recreation, and economic development are expected benefits of its completion. Project 3 connects a trail gap between Mt. Washington in Baltimore City and Hunt Valley, Baltimore’s most northern suburb. The completion of the project would also fill in the missing vertebrae in a trail spine and create a continuous link from Baltimore’s Inner Harbor to York, Pennsylvania. The Torrey C. Brown trail is, arguably, the Baltimore region’s most popular paved trail. It is heavily used and is part of the Rails to Trails Hall of Fame, but it is isolated. This connecting project would have to bisect suburban neighborhoods and would likely contain some street routes in spots (with buffered lanes). The bad news is there is no obvious path north of Towson, but the good news is there are many possible routes the trail could take. 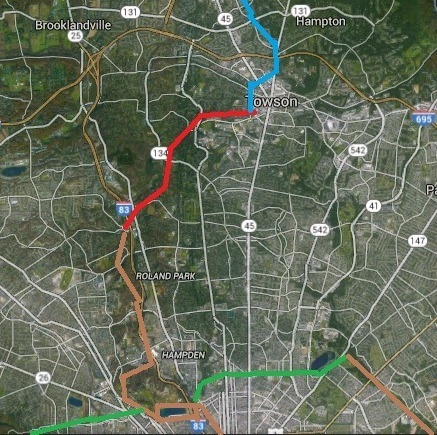 This project could be challenged by NIMBYism and crossing over the 695 Beltway may be a challenge depending on the course. There are many reasons this is a good project. We will start with the East Coast Greenway (ECG). The ECG plan is a continuous trail from Maine to Florida. Project 3 fills a key gap in the ECG. Another good reason is access. By extending the mostly rural Torrey C. Brown Trail into the inner suburbs and ultimately the city, far more people will be within reach of a super trail. 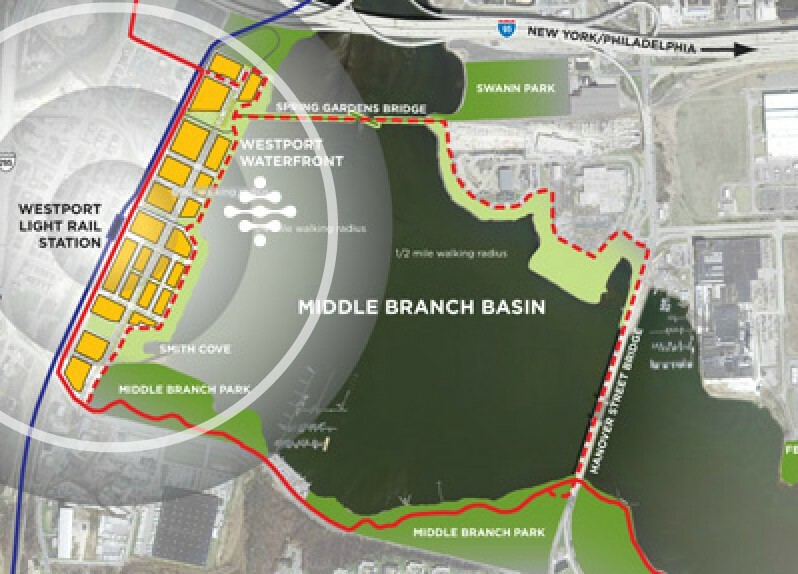 The Middle Branch Trail Loop, if completed, will hug the water and help connect Baltimoreans and visitors to the city’s waterfront. The Middle Branch is destined to be the new home for Under Armour. A premier waterfront recreational amenity would be a great cultural compliment between the company, the city, and the water. The challenge is adding a trail facility on a little-used century-old CSX owned swing bridge and the heavily used Hanover Street Bridge. Furthermore, Under Armour would need to be supportive of a public facility and not seek to privatize the space to the water’s edge. An urban waterfront loop that utilizes two large bridges may be a big attraction because it’s a unique design that’s rarely implemented. Also, a trail running across a former train bridge adds historical value. Towson Run Trail would mostly follow the creek between Lake Roland and Towson. 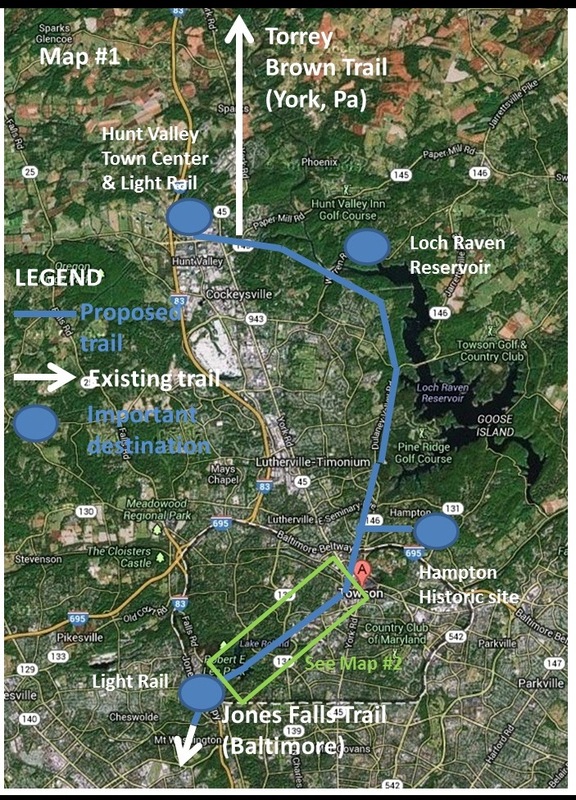 Building a trail adjacent to the Towson Run stream into the center of the university and to the business district appears to be feasible, but might face some NIMBY opposition in the area between Lake Roland and Charles Street. The trail may need a bridge to cross Lake Roland. This is a good project because Towson, the Baltimore County government seat and home to over 55,000 people, has few recreational bicycle facilities. 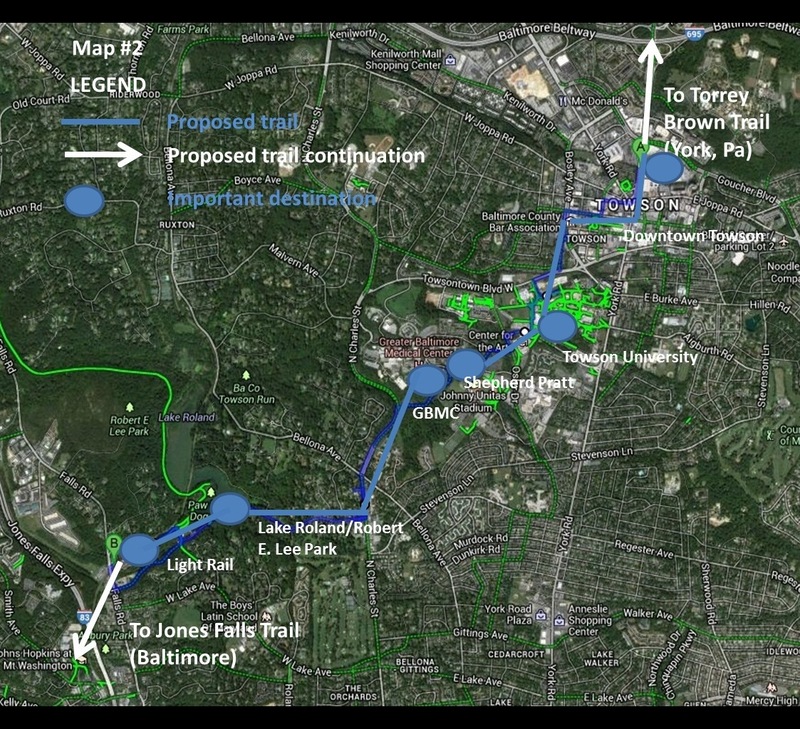 Linking Towson via the valley of the Towson Run Creek into the Jones Falls Trail would help solve that problem, while tying Towson into the regional trail network. This project could fill a gap in the East Coast Greenway Project and share the first five miles of Project 3. This project is identical to Project 1 for about the first seven miles, sharing the Patapsco River Valley at its source in the Middle Branch. Project 1 makes a southerly turn to connect with the BWI Trail. Project 6 continues northwest along the Patapsco Valley paralleling the river. It will feed into the Grist Mill Trail and then extend into historic Ellicott City. This project appears logistically easy because of existing public right-of-way next to the river. There are a few places the trail will likely have to go underneath major roads. There will be some wetlands the trail may pass through. Project 6 is a trail with tourist and transportation benefits. It would connect charming historic Ellicott City with downtown Baltimore, while taking a scenic, flat, and relatively direct path along the river. It would provide a great day trip in either direction. Regions in the Northeast and across the US are investing in their trail networks and marquis trails. They know that quality of life amenities are a major component to region attractiveness and competitiveness. The Baltimore region’s trails are inferior to many of our competitors and the gap is widening. It may be a leap to propose more trails when some of our major existing trails are not well designed and are in poor repair. However, the workforce of the future and tourists will want quality trails. The state, counties, corporations, or even wealthy individuals should help fund it. It is time for Baltimore to develop a regional trail plan and invest. Part I: Could the Jones Falls Trail and the Torrey Brown Trail connect? First, regional trails should not come at the expense of a micro-network of bicycle connections in our communities. Trail links to schools, shopping centers, main streets, transit stops, downtowns, and employment centers are the most useful bicycle investments. With that being said, thoughtfully planned regional trails can complement the above while also providing opportunities for trail tourism, economic development, commuting, recreation, and a regional amenity that helps us compete with other regions in the quality of life category. There are many aspirational comparisons by Towson’s business and political leaders to Bethesda. 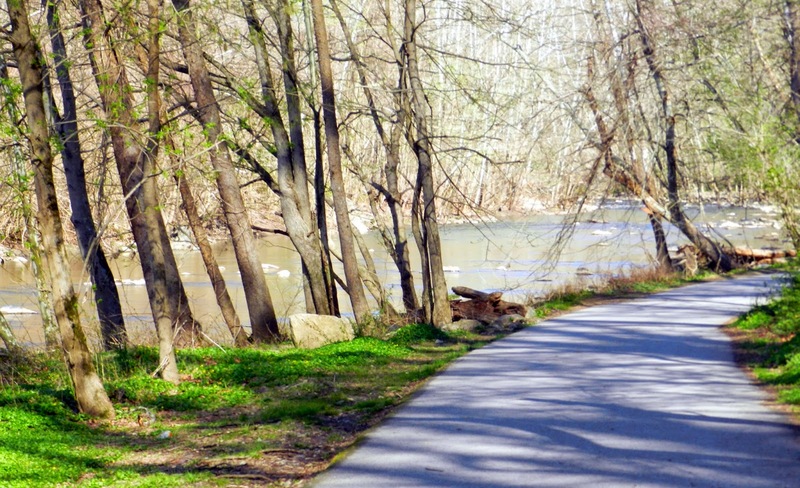 One of Bethesda’s gems is the Capital Crescent Trail that weaves through Downtown Bethesda before connecting to the Potomac River, C&O towpath, and on to Georgetown. Proposed here is a new trail connection between the *Jones Falls Trail and the **Torrey C. Brown (NCR Trail)/York County Heritage Trail and filling a missing link in the East Coast Greenway. There are several options, but we also have a general route in mind. Trails are not free to build. The Jones Falls Trail costs are approximately $850,000 per mile. Accordingly, this project would cost between 15-20 million to construct. The author thinks it is worth it. Well-designed and utilized urban/suburban trails are multi-purposed investments because they can boost community health and provide new transportation options. This trail could also attract serious bicycle tourism. Museums, the zoo, festivals, sports events, fishing, water sports, fine dining, historic sites, shopping, hotels, can all be incorporated into a trail visit package. Maryland can see a multi-faceted return on its investment by thoughtfully constructing the missing piece. *The Jones Falls Trail (six miles) is a relatively new trail extending from the Baltimore Visitors Center (Gwynns Falls Trail) to the Cylburn arboretum with an extension planned to Mt. Washington. The trail goes through urban and natural settings. The trail passes historic sites and monuments, the Maryland Zoo, Druid Hill Park, and views of Jones Falls River along its path. **The Torrey C. Brown Trail (20 miles)/York County Heritage Trail (also 20 Miles) connect York, Pennsylvania with Ashland, MD. The trail has beautiful rural scenery, is very popular, and provides a large economic boost to the communities along the trail, York, Pa and New Freedom, Pa in particular. One of the many buildings designed by architect Calvert Vaux in the 1860’s. SP has a number of interesting historic buildings on its campus.